Try Constant Contact for 60 Days Free! Give Constant Contact a shot with a free 60-day trial to help you get used to their template system, import contacts, test their support and more. Constant Contact is a US-based company based in Massachusetts with offices throughout the US as well as in London. They got their start in 1998, which means they have a lot of experience and have had time to build up a huge following. With more than half a million customers around the globe, Constant Contact is an industry leader. With Constant Contact, you’ll be able to create your awesome-looking emails with a simple drag and drop interface, integrate with social media, track your opens, clicks and much more. With their service, you are limited only to the total contacts in your list, you’ll be able to send an unlimited amount of emails to your opt-ins. Offers a no-risk free trial that doesn’t require a credit card. They are willing to personally coach you through your campaigns by phone, email, chat, and even in person. Split-testing, which is included by the more popular email marketing services, requires a 3rd party plug-in called Unbounce that starts at $50/mo. 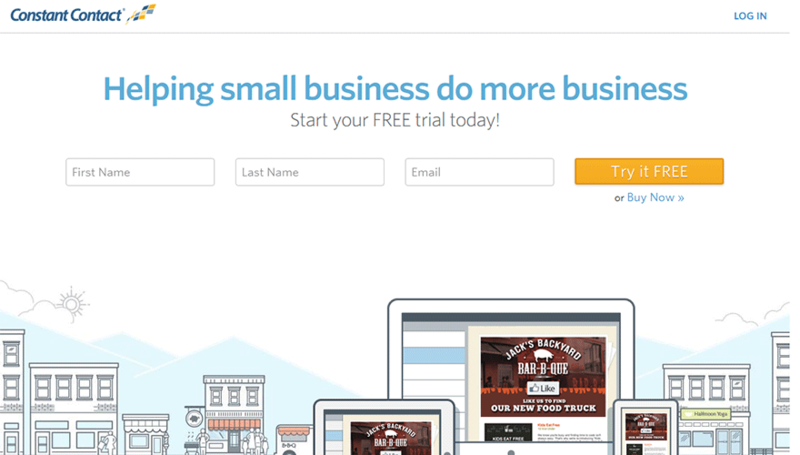 You can get started easily with Constant Contact with more than 400 free HTML email templates. You can use a drag-and-drop system to set up your layout or you can use HTML if you prefer. There are options for fonts, colors, images, and more. You can upload your logo and insert social media links so that people who read your emails can easily send them on to their friends via their favorite social networks. The Forward-to-a-Friend option makes it easy to forward you emails without using social media as well. The formatting toolbar follows you as you scroll down the page so that you don’t need to scroll around looking for it when you want to make changes. There is an added fee if you want to modify the footer. Constant Contact allows you to preview your emails to see how they’ll appear when they go out, and you can also run an anti-spam test to make sure your emails will make it through filters. A web form you can add to your site or to Facebook helps you to find new subscribers, and you also can import subscribers from other contact lists in different programs. Segmentation is one of the key features of email blast software like Constant Contact. You can segment in Constant Contact based on location, demographics like age, interests, and other characteristics. You can also combine your segments into larger segments if you want to send out an email to a larger group, and if people appear on your lists multiple times they’ll only get a single email. The main drawback we discovered with Constant Contact is that in order to do split-testing, you have to purchase a third-party plug-in called Unbounce. Unbounce costs $50.00 per month, which raises the cost of the software a great deal if you need split-testing. Split-testing may not be important to everyone, but it’s very helpful to a lot of businesses. With this feature you are able to send out two messages to two groups to test which message is more effective. It’s a powerful email marketing tool which allows you to more easily adapt and optimize your campaign for the best results. The tracking and reporting system in Constant Contact lets you see what percentage of your list opened your emails and which subscribers interacted with your messages. You can also see which links your subscribers click on the most and by adding Google Analytics to your site, you can also see which links and which emails generated the most revenue. Stats also show you how much conversation your emails have generated on social networking sites, and you can compare the results from different email campaigns you’ve run. You can track forwarding as well as opt outs and sources of growth for your mailing list. See where most of your new subscribers are coming from. The stats also let you know which addresses are bouncing so you can remove defunct subscribers from the list and save resources and money. Customer service looks to be a strong area for Constant Contact. You’ll find help through the Resource Center, which includes community features like discussions and local events, general help resources such as an FAQ page, support blog and phone, chat and email support links, as well as a place where you can view your support history and follow up on past issues. The third area in the Resource Center is the Education & Training area which provides you with access to live and recorded webinars, live regional seminars, boot camp classes, hints & tips articles, a blog and product tutorials. There are a number of unique offerings listed under “Custom Services.” This is where you can sign up for fee-based consultation. Expert help is available for starting up your campaign, creating a custom template, modifying your footer, or building a premium list (20,000 contacts or more). Live coaching can assist you not only with the features of the bulk email software but also with the principles behind targeted email marketing. Prices are reasonable without the add-ons; $15.00 per month will allow you to use the email marketing services for a list with up to 500 subscribers. The top tier listed costs $150.00 for 25,000 subscribers, but higher tiers are available if you have more subscribers. The drawback however is that you don’t get to modify your footer without paying a fee and technically all of these packages cost $50.00 per month more if you want to add split testing to your package. If you choose this option, Constant Contact ceases to be particularly cost effective. There is a 60-day free trial which you can use to decide whether Constant Contact can fulfill your needs and whether the price is worthwhile to you. You don’t even need to provide your credit card number to access the free trial. There are also prepayment discounts available. 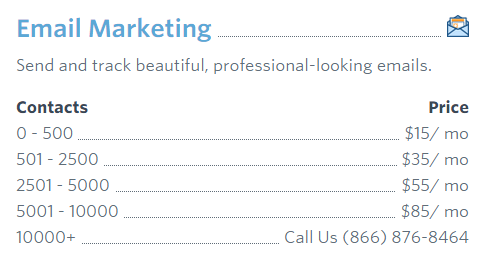 Constant Contact is one of the longest running and most popular email marketing services on the web. While the lack of split-testing is a drawback, there is no denying that the rest of the features are great and that the customer support is top of the line. Not a lot of other services are willing to personally coach you by phone, email chat, or in person.